Today is January 26 and it has been warm enough that Rosemary and I worked in the garden. It is my job to remove the rose leaves particularly the ones with black spot or the withered yellow ones. But there is one surprise. There is a bud of Rosa ‘Abraham Darby’ that is pristine and is from last year. Will last year’s last rose be the first to open when it gets warm? 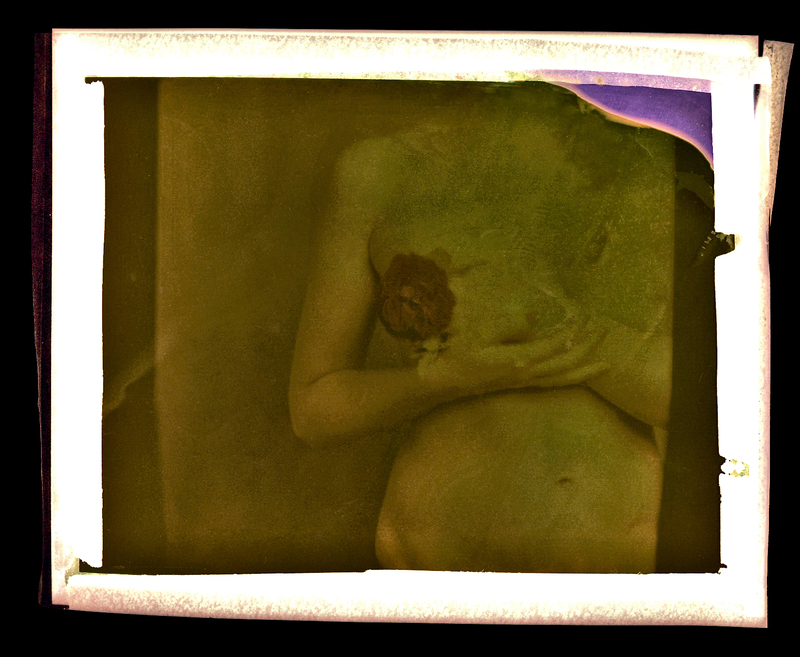 With all my roses and their scent in my memory there is this Fuji Instant Colour Film that I took last year that I bleached to get the image seen here. I have an envelope with dozens of these Roid peels. I am randomly removing two or three and processing them to see what’s in them. In plain sight there are jet black on both sides. There is red rose and a voluptuous woman, a strong hand and with a beautiful hip and a belly button, just in the right place. I frown on photographers who like to give their photographs either romantic names or funny names. Photographs do not need names to be savoured or understood. And yet I cannot resist – The Rose Hip.